Kinetic energy is the energy possessed by an object due to its motion. And, the energy gained by an object because of its position is called potential energy. Mechanical energy is the sum of potential energy and kinetic energy. Energy, in physics, the capacity for doing work. It may exist in potential, kinetic, thermal, electrical, chemical, nuclear, or other various forms. There are, moreover, heat and work—i.e., energy in the process of transfer from one body to another. After it has been transferred, energy is always designated according to its nature. Hence, heat transferred may become thermal energy, while work done may manifest itself in the form of mechanical energy. All forms of energy are associated with motion. For example, any given body has kinetic energy if it is in motion. Kinetic energy, form of energy that an object or a particle has by reason of its motion. If work, which transfers energy, is done on an object by applying a net force, the object speeds up and thereby gains kinetic energy. Kinetic energy is a property of a moving object or particle and depends not only on its motion but also on its mass. The kind of motion may be translation (or motion along a path from one place to another), rotation about an axis, vibration, or any combination of motions. Potential energy, stored energy that depends upon the relative position of various parts of a system. A spring has more potential energy when it is compressed or stretched. A steel ball has more potential energy raised above the ground than it has after falling to the Earth. In the raised position it is capable of doing more work. Potential energy is a property of a system and not of an individual body or particle; the system composed of the Earth and the raised ball, for example, has more potential energy as the two are farther separated. 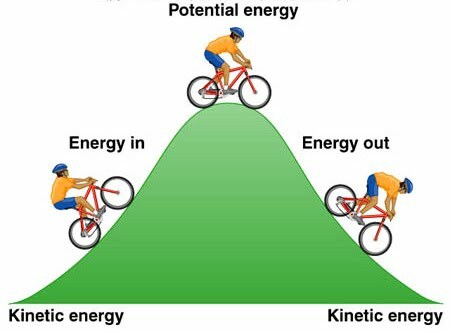 Also, you can get more information about kinetic energy and potential energy from the link below in addition to the explanation above.